An ideal place to stay, The Crystal Lodge Hotel is a good accommodation choice in London. 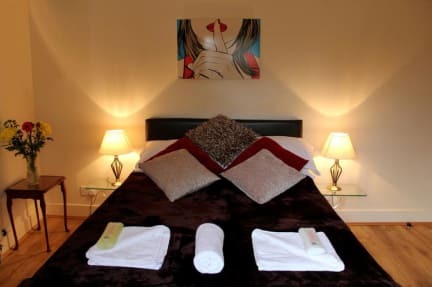 The Crystal Lodge Hotel in London is the perfect choice for anyone travelling with a partner and looking for great value accommodation in the city. Stay here and you'll have access to an area outside and its Wi-Fi. We are a very well presented Bed & Breakfast Hotel that has been welcoming guests for the last 15 years. As a small Bed & Breakfast we offer a warm welcome to all our guests, providing all what you need to feel that you are coming from home to home. We have a very friendly Lounge room, Fully equipped kitchen to use, and well presented Garden. Free Car park , Free Wi-Fi access 24 hours, Fax and Photocopy machine is available. Crystal Lodge Hotel is e located in Thornton Heath.Our Location makes us very easy to reach, Thornton Heath train station is only 3 minute walk up the road with easy access to Central London means you can reach Victoria Station in less than 15 minutes. Gatwick airport can easily be accessed within 30 minutes. Crystal Lodge Hotel offers a wide range of services and facilities to make your stay more enjoyable; Tea and Coffee making facilities, Colour Television in all rooms, Continental Breakfast from 7:30am - 8:30am, We have on site car parking secured with 24 hours CCTV surveillence, Free Wi-Fi access, Croydon Town Center only 5 minutes away, Thornton Heath train station only 3 minute walk, Local Mini-Cab services, Home Office 8 minutes away, En-suite rooms available, Housekeeping from 7 am to 2 pm, All types of rooms are available ( single-double-Triple-Family), Rooms on the ground floor with wooden flooring are available for those they can not walk up stairs. The place was good. It's a 5 minutes walk to the train station that bring you to central London. Friendly staff. Breakfast was included which is a plus. Staff very friendly, good value for money and not a bad location. Women Beware. Receptionist was a total creep who tried to get me to have coffee with him, kissed me hand, and has ended up trying to contact me. Avoid at all costs. Staff were friendly and helpful. "Hotel" located very close to Thornton Heath rail station, but it was a dump. I've stayed in much nicer hostels for much less.